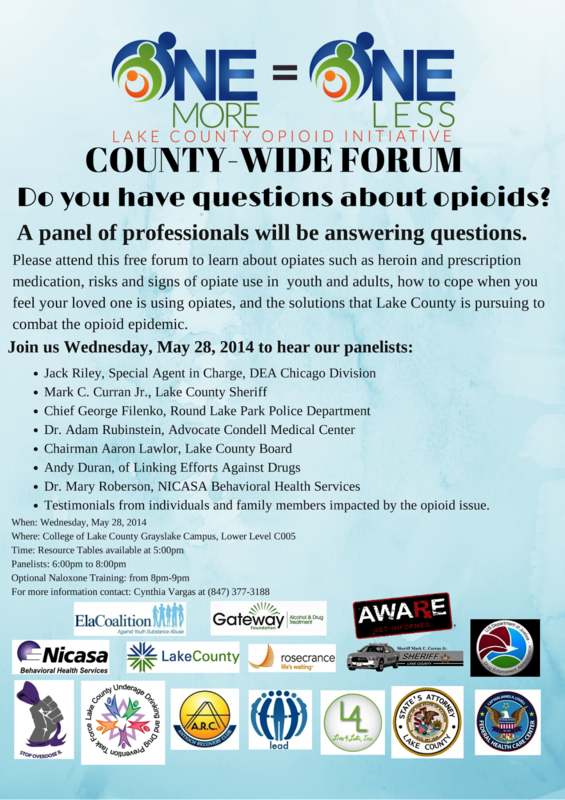 Members of the Lake County Opioid Initiative will host a county-wide forum from 5 to 9 p.m. May 28 at the College of Lake County, 19351 W. Washington St. The forum aims to inform community leaders, educators, treatment providers, and the public about the prevention and treatment of heroin and opiates addiction. Questions will be answered as they relate to heroin and prescription medication, risks and signs of opiate use in youth and adults, how to cope when you feel your loved one is using opiates, as well as the solutions that Lake County is pursuing to combat the opioid epidemic. A group of professional panelists will be available to answer questions. Providers will be available with resources. The Lake County Opioid Initiative is comprised of members from law enforcement, first responders, treatment providers, local hospitals, school districts, faith-based groups and government officials. For more information, call (847) 377-3188.